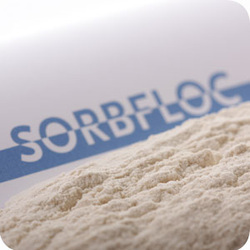 Sorbfloc® is manufactured with patented and proprietary processes owned by our manufacture partner FMC Corporation through FMC Biopolymer. It basically consists of hydrocolloid extracts of sea weed, red algae, micro crystalline cellulose or pectin. All natural products from renewable scources. The Sorbwater Process Technologies is based on bringing Sorbfloc® in contact with the contamination in the waste water in a continuous water flow, by online dosing and extremely efficient mixing it into the waste water. Sorbfloc® can be dosed and mixed into the waste water stream as dry powder, concentrated slurry, or premixed in makeup water. SWT owns IPR rights to a new application of these hydrocolloids used, in combination with or by addition of, mono-/divalent-/or multivalent ions. The hydrocolloid simply encapsulates all and any oil droplets or particles in water. By cross linking reactions with these ions the hydrocolloid and the encapsulated pollution gels into super strong conglomerates which can be removed by conventional methods for separation from water. This enables a new era for cyclones, centrifuges, separators, flotation units, membranes, filters and screens in water and waste water treatment.